OK, this is great, and the bag is really sweet. And I can make one of those – maybe that will be my next project. What an absolutely lovely idea! This is a keeper. Thank you for sharing it. Generous spirit filling a need !! 🙂 Blessings on you and your family! You are such a blessing to everyone!!! 2. The bag is so sweet. Simple, useful and great way to use up scraps. You are so kind. This is a wonderful idea. I might use my fabric scraps to make a few. We also receive small sized toothpastes from our dentist, and the occasional lotion from a hotel we can pass on. A pair of warm socks might go in there as well. Wonderful idea … shows how caring and thoughtful you are ! A grandma could only dream that a craft/gift would be used for such a wonderful thing. I thought this was such a good idea that I had to share it on Facebook. So often we see someone who could use such a gift as this. Thank you for sharing it. If I want to re-blog this, would I have your permission? Inspiring. So simple. What a lovely idea. Great idea, I shared with my friends on Facebook, thank you. Lovely idea. Such a need for stuff like this especially with the holidays upon us. Once again….”nailed it”!! Especially going into a season that is crazy stressful in the “gift giving” department!!!! Blessings……. GOD BLESS YOU – THIS IS DEFINITELY A REBLOG! This blog post from PILLOWS A-LA-MODE was such a great idea I wanted to pass it along. The great thing about this idea is that it’s not limited to just edible items. With winter just around the corner you can add mittens, or a scarf or hat as well. Also, you may not want to leave it in your car during the colder months but maybe leave it by your front door to take with you when ever you use your car. Katherine, that is a lovely idea. I used to carry food in my car to give to homeless rather than money and would drop off blankets, along with my and my children’s outgrown winter wear and pjs to homeless shelters, of course I made sure they were in good condition. Those who are needy really do appreciate every little bit of help. 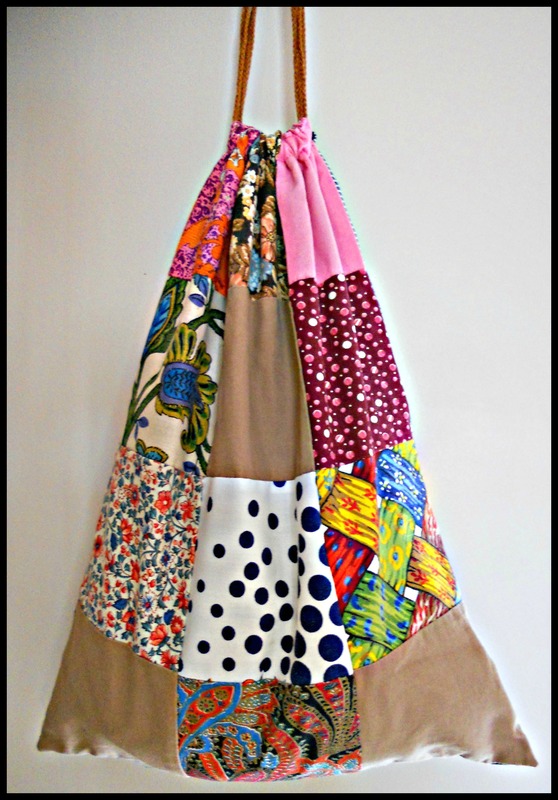 I too fell in love with this simple patchwork drawstring bag. The idea of filling it with a few emergency supplies was a clever idea too. Great thinking. What a beautiful, amazing idea. I am so inspired. I will be doing this! What a wonderful, thoughtful idea!